Cream of the Crop | United Cooperative Services. SAFETY IS JOB ONE—United CEO Cameron Smallwood, left, and manager of operations Ed Nuñez, right, recognize Lineman of the Year Trey Carper, center, during the 2018 Annual Christmas Party. As he came to the stage, it was clear he was deeply touched. Mike Houston, right, stands with previous winner Denise Robertson and United CEO Cameron Smallwood, left, during the awards ceremony. Michael Huston, facilities and print shop director in Stephenville, seemed a little misty-eyed as he received the 2018 Volt Award — an honor reserved for employees who have promoted and demonstrated the co-op’s continuing commitment to safety, leadership, productivity, innovation and teamwork, as well as portraying a professional representation of the cooperative in his or her daily work. Huston was one of two winners honored Dec. 7 during United Cooperative Services’ 2018 Christmas party. 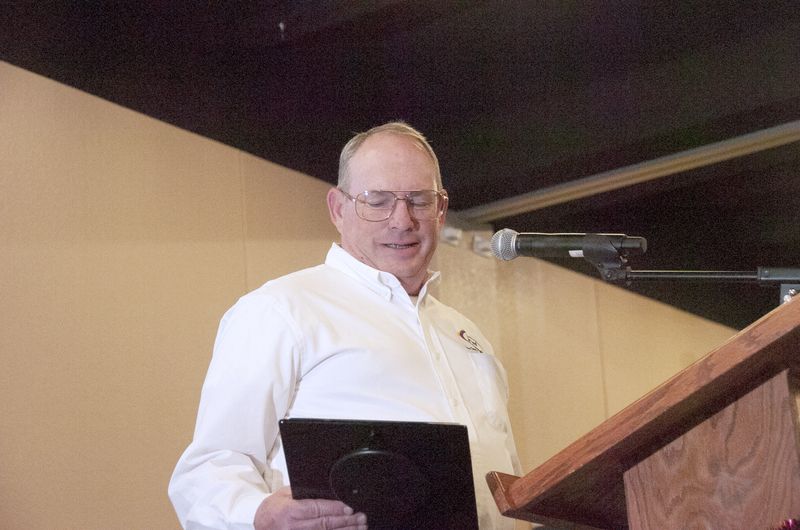 Trey Carper, a journeyman lineman at the cooperative’s Burleson office, received the 2018 Lineman of the Year award. This award symbolizes a United lineman’s commitment to safety in hazardous work environments and the proud heritage of service and dependability the cooperative’s operations crews provide daily to United members. Both honorees received standing ovations as they went up to the podium to be recognized. 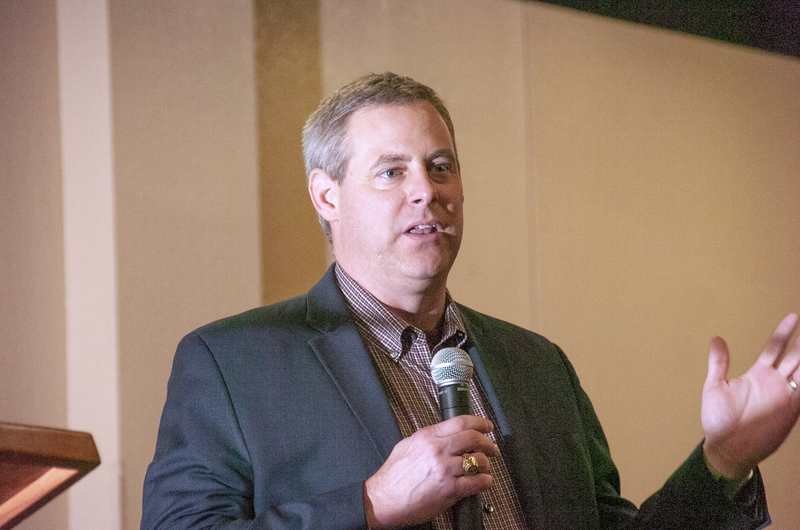 United CEO Cameron Smallwood said the coveted employee awards serve as the annual highlight and observance of the cooperative’s goal to surpass member expectations for service reliability and value. “This year, we had two very deserving employees win these awards,” he said. “Despite this year’s challenges, we continue to lead in safety with a 2.4 million hour benchmark without a lost-time accident. That represents more than eight years in total. We also launched our 9.9-megawatt United Community Solar project, which was not only a challenge, but also a huge success. Finally, each and every one of our employees worked tirelessly during the February 2018 ice storm, which was the worst I’ve seen in my 20-year career, and may be one of the worst United’s ever had to overcome. Huston began his career in August 1998, serving as a custodian and mailroom helper at Erath County Electric Cooperative. He joins previous winners Denise Robertson, Jason Dillard, Patty Holleman, Jerry Scott, Johnny Hazzard, Robert Bernhoft, Seth Rosser, Robert Sherman, Cory Menzel and Wes Burton as the 11th winner of the Volt award. He also remembered when Johnson County Electric Cooperative and Erath County Electric Cooperative first consolidated into UCS, Landy Bennett (currently chief administrative officer for the co-op) told all employees to have fun while getting our jobs done. Carper said that though several people told him he might be chosen as Lineman of the Year, he didn’t believe any of them. That is, until he heard his name. Carper started his career at United in August 2007 as a groundman. He joins Ben Perry, Ed Nuñez, Mike Fergason, Mark Buckner, Robert Rejcek, Jeremiah Esquell, Gary Sims, Jerry Don Robinson, Jeff Pannell, Travis Ashworth, Joe Ponce, Jim Young, Arick Wienecke, Carlos Martinez and Josh Koopmann as the 16th recipient of the award. Prior to recognizing Carper as the 2018 winner, Smallwood discussed how a newly chosen Lineman of the Year always demonstrates that safety is the No. 1 priority at the co-op.